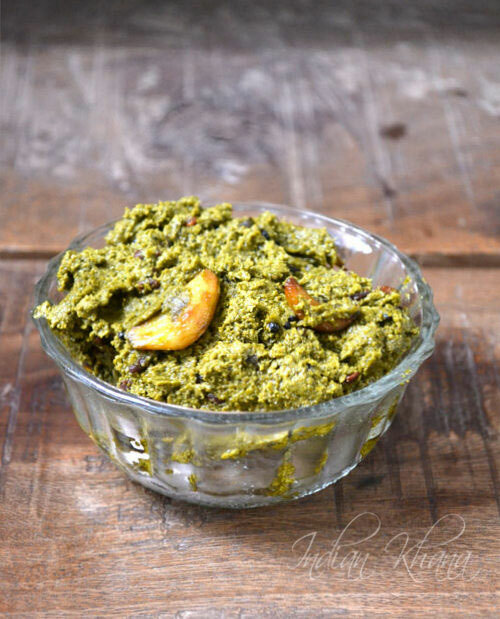 Gongura Pachadi or Chutney is popular Andhra recipe made of gongura or sorrel leaves or khatta bhaji as it's called in Hindi. It's very easy and taste really delicious it goes best with steamed rice but we can eat it with anything it taste wonderful with just anything for me. I learnt this recipe from my sis's MIL whom makes this pachadi so well and from then whenever I get sorrel leaves I made this chatni for sure. This time I made this at my in-law place as now is khatta bhaji (sorrel leaves) season and we can find it everywhere so for a change. 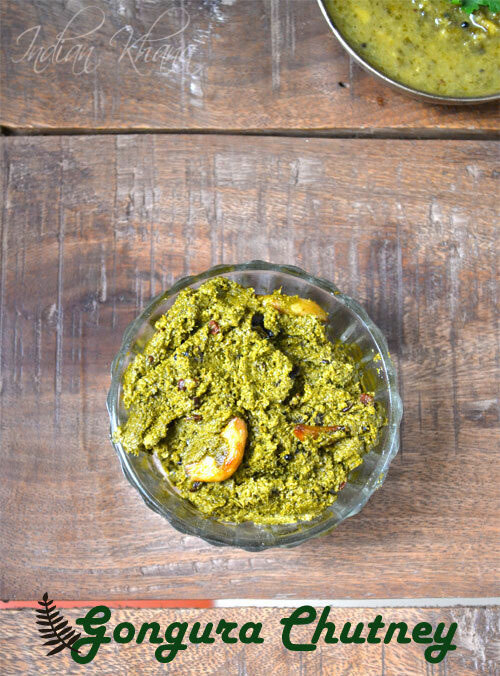 To let my in-law taste goodness of Andhra I made this chutney and everyone just loved it. It was over in no time and everyone kept asking for the recipe so you get the point it's good go and make some now if you can find gongura leaves (sorrel leaves) and enjoy along with family and friends. 1. Clean, wash gongura/khatta bhaji well. Blanch leaves with green chilli (boil gongura leaves with green chilies until soft for 4-5 minutes). 2. Drain water allow leaves to get cooled and grind along green chilies into smooth paste (don't use water). 3. Roast sesame seeds until light brown or until it starts to pops. 4. Allow sesame seeds to cool and grind into smooth powder. 5. Heat a kadai (wok) add gongura puree and cook until water evaporate and chutney becomes thick around 4-5 minutes. Add sesame powder, salt and mix well. 6. In another pan or kadai heat oil add all the times for tempering and saute until garlic becomes golden brown. 7. Pour prepared tempering over chutney and mix well, cook in slow flame keep stirring until oil separates around 3-4 minutes, off flame. Serve with steamed rice or anything of your choice. Store in fridge for 2-3 days and enjoy the chutney. wow that looks really yummy. Must be a wonderful side dish for Idly or dosa too. Nice pachadi Preethi.All my andgra friends make this in the same manner.Will give it a try and let you know how it turned out. yummyyyyy.. looks like this pachadi goes well with almost anything..
Pachadi looks yum !! Nice entry !! Congrats on ur award !! Pretty healthy! I like it a lot! Priti, healthy pachadi...am also like u, if i prepare any pachadis..i'll have them with everything..
looks yummy,nice recipe.....my telugu friend has promised to make this for me..AM waiting for it..
Yup Vidhya...I think with anything it will be yum. Sowmya...now you can try on your own..with this recipe ;)..
nice recipe Priti..thanks for sharing. Please collect the award at my blog. U deserve it! 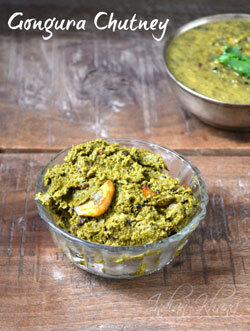 just now I saw gongura pachadi on Rekha's blog. Now I came here and found another gongura pachadi. Looks so yummy Priti! I never knew we can add sesame powder to this pachadi. A new interesting twist to the traditional pachadi. Thanks for this delicious pachadi. I too had done this but it is a different version. Check it out in my blog. thanks for stopping by too. this looks so yummy, and all that green is so healthy! i will defn try this. now a stupid question? where can i get gongura leaves and what do they look like? Wow this looks simply awesome. Nice and easy way to make also. I love gongura! I complained to my sis the other day that I feel like eating a pickle & she made Gongura pickle - andhra style & got for me!! I am on top of the world. The chutney you made is a regular at my mom's - tastes heavenly with hot rice drizzled with ghee & raw onion! The gongura pachadi looks gr8. Have had gongura prawns here in vizag and it was gr8. Here its very rare to get gongura leaves....will try it once i go to my hometown....BTW your recipes looks yummy!!! I've never tasted it before, but looks real tasty...yummy creation! Wishing you and ur family Happy Diwali Ghongura pachadi looks yumm and greeny, have never heard about these leaves...but it looks really inviting. Will try this for sure.. Wish you and your dear ones a very Happy Diwali!